This text effectively guides every step of the way through the many working elements of a case—showing not only how, but when, to apply the various legal principles and techniques of products liability litigation. A practical vehicle for understanding and using the black letter law of products liability. Over 240 illustrative fact patterns offering "nutshell" descriptions of representative liability cases, including the amusement park ride, the weight-loss drug, and the fallen power line. 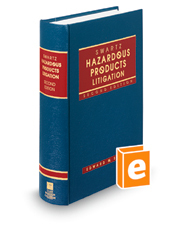 Covers legislation affecting hazardous products litigation, including federal statutes, impact of state legislation on trials, and manufacturers' efforts to abolish common-law rights.